Spray inside of large microwave-safe mug with cooking spray. 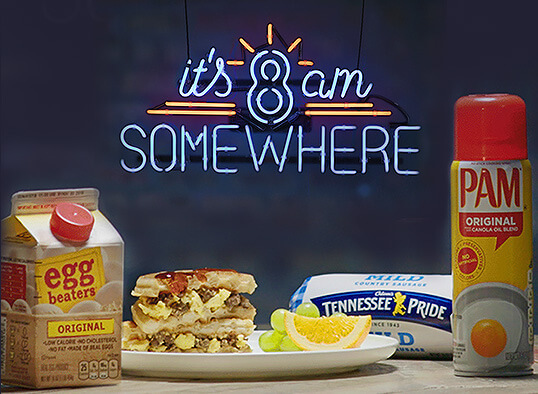 Stir together Egg Beaters, Canadian bacon, cheese, English muffin pieces and pepper in mug. Microwave on HIGH 1 minute. Stir; microwave 30 seconds more or until set. Serve immediately. The scrambler puffs up and fills the mug while cooking. It falls quickly once removed from microwave. 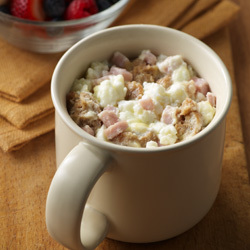 Use a large (15-ounce) microwave-safe mug to hold the ingredients and to reduce the chance of overflow. Mugs that are wider and shorter work best. A 2-cup glass measure may be used as well. Microwave wattages vary; adjust cook time as needed. Cook the scrambler just until the egg is set.